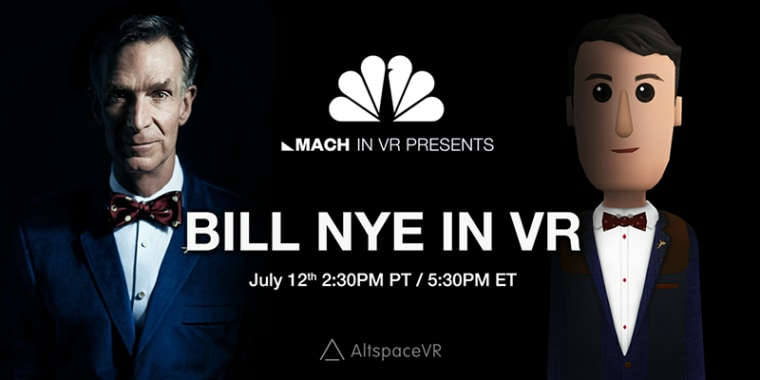 On Wednesday, July 12, the Science Guy was the featured guest on the latest episode of MACH in VR, the new virtual reality series from NBC News MACH. The one-hour event — Nye's first ever trip into VR — took place in AltspaceVR, a leading VR app, at 5:30 p.m. Eastern Time on the twelfth. Nye was interviewed by MACH’s editorial director, David Freeman. The wide-ranging discussion was followed by a question-and-answer session where audience members posed their own questions to Nye. The event was free of charge and open to all. Anyone with a VR headset (HTC Vive, Oculus Rift, Google Daydream, or Samsung Gear VR) could join. Those without headsets attended in mobile view mode with a compatible Android phone or in 2D mode on a qualifying Mac or PC, as well as via a YouTube live-stream (see below). Previous episodes have featured Seth Shostak, a leading expert on the search for extraterrestrial intelligence, and Sean Carroll, a theoretical physicist at Caltech. More episodes are in the works!